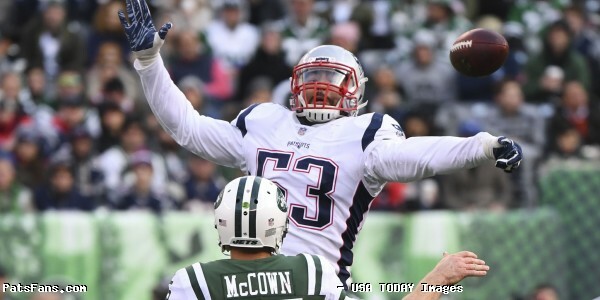 After winning two championships and playing in three consecutive Super Bowls, linebacker Kyle Van Noy has fully bought into the “Patriot Way” and defended it on Twitter Tuesday. Van Noy’s former teammate with the Lions and current Colts tight end Eric Ebron shared a tweet trying to recruit free-agent safety Landon Collins to Indianapolis . Lions defensive back Quandre Diggs jumped in on the tweet tying to get Collins to Detroit instead. ex Patriots coordinator and Lions head coach Matt Patricia. Van Noy caught wind of the post and quickly fired off a few ring emojis in defense of his team. This entry was posted in 2019 Patriots Offseason, Patriots Twitter and tagged Eric Ebron, Kyle Van Noy on March 9, 2019 by Robert Alvarez. The Patriots were facing a short week and a familiar nemesis or perhaps that is a harsh term, foe may be a better description. Other than the ones who began the entire Deflategate fiasco with the league, the Patriots have owned the Colts for the previous seven games winning by an average of about 20 points. Thursday night began much the same way, the Pats were up by 21 at the half and it looked like they may hang a 50 burger on a very shorthanded Colts team. And by all accounts, they should have. But sloppy ball control in the second half cost them and due to the outstanding effort of Andrew Luck, the Colts narrowed the score to 24-17 and it was a game. The Patriots quickly responded and put two more scores up to put it back up by 21 before Luck led a late drive to make it seem respectable at 38-24. This was Thursday Night Football in a microcosm. Dropped passes on both sides, five turnovers, players getting hurt. Not to mention those god-awful all blue monstrosities that pass for uniforms. Hell Indianapolis couldn’t even field an entire 46-man team last night. But hey Commish, tell us again how the players’ safety is #1 in your book. So, check out our grades and see how the team fared in this week’s blowout win. Tom Brady was totally in control last night and was meticulously picking the Colts zone defense apart from start to finish. He started the first drive of the game by going 9-9 and throwing a touchdown pass to Cordarrelle Patterson. Of his first 13 passes, the only incompletion was a drop by Julian Edelman. He did miss a few throws to Josh Gordon, but we chalk those up to be still working on their chemistry and timing together. But last night one got the feeling that the Colts defense wasn’t going to stop them, and it was correct. He threw for 341 yards and three TDs while completing 34-44, and it could have been even more. His two picks were not only preventable but right in the hands of his receivers, one of which looked more fumble than interception…but whatever. Brady passed two big milestones becoming the 3rd member of the 500 TD club and the only one to do it with one team. He also set a new record by passing a TD to 71 different receivers, more than anyone else. The Patriots running backs had another very productive night. Sony Michel just missed a second 100-yard outing getting 98 yards on 18 carries. His 34-yard touchdown run was stuff we saw from him in college. In the past five days, Michel has gained 223 yards on the ground. And he’s getting better every day. James White was a guy we highlighted to have a big game and we were spot on there. White caught 10 passes for 77 yards and a touchdown and is so valuable in the Patriots passing game. Michel needs to get better, and will, in the short-yardage running game, but that isn’t really his strength. James Develin continues to amaze as a blocker in the running game. The wide receivers are now finally all in place, and you know what, you can stop lining up at the Tobin because “Bill doesn’t give Tawmmy enuff weaponz”. This group looked very dangerous and they’re just scratching the surface of their potential. Julian Edelman is back and answered the questions as to whether he’d still have the quickness that we’re accustomed to seeing. He made his mark on the game right off the bat, catching three passes on the opening drive. Gordon is still learning the offense and was only targeted a few times but had two big catches including the highlight reel 34-yard touchdown pass from Brady. Chris Hogan, Phillip Dorsett, and Patterson are now the complementary guys and as such their production was just fine, 8 catches, 70 yards, and a touchdown. Hogan had the one brutal drop for a pick. Rob Gronkowski was obviously hobbled and in pain last night, one could see him limping several times after the play. But Brady and offense didn’t go thru Gronk and his numbers were OK, 6 catches for 75 yards. On the dropped/interception/ fumble, which we thought was a fumble, had it stood up he would have ended with 7-90, and yes we would gladly take that on a bad ankle. The offensive line was once again outstanding last night. The Colts entered the game with 17 sacks in the first four games and Brady’s pass protection was, for the vast majority of the game terrific. They had just 4 QB hits and 0 sacks. Michel had room to run again and the boys up front did a fantastic job. Rewatch Brady’s 500th TD to Gordon, and he had an unreal amount of time to throw the football. The defensive line did an okay job of stuffing the sputtering running game against the Colts. They had a big run at the end of the first half and some yards late in the game, but overall, it was good enough to force Luck to have to pass 60 times. The team only had one sack, a nice play by Trey Flowers in the first quarter. Adam Butler made a nice play of recognizing a screen pass and stuffing it for a loss. Adrian Clayborn had his best game of the season and was getting a lot of pressure on Luck. His pressure caused the Chung interception. This wasn’t the fantastic day they had on Sunday but it was good enough. The linebackers were tasked with covering the running backs and they did a decent job of it. Nyheim Hines led the Colts with 22 receptions and he made 7 last night but for just 45 yards, which while solid enough numbers, wasn’t what the Colts needed with an injury-depleted roster. Hightower got beat by Eric Ebron on their final touchdown with a minute and a half to go when he bit hard on a run fake. The secondary wasn’t quite as bad as some were pointing out last night. Luck put on a nice show and threw for 365 yards and was dropping some really nice throws that was belying the hot take that his arm strength was suspect. He also threw 60 passes so he was averaging less than six yards per pass. His passer rating was around 84 so that wasn’t great either. Jason McCourty had another strong game and is quickly becoming a very solid as the second corner. Stephon Gilmore was solid all game long, he was burned on one deep route but the receiver dropped the ball. Jonathan Jones had a rough night and Luck was picking on him. Luck’s best target was TE Eric Ebron who gave Devin McCourty fits. Pat Chung also shared coverage responsibilities with Ebron. The two safeties got low marks for that, however, Chung was making plays all over the field and had 11 tackles, an interception, and a QB hit. McCourty forced a turnover too, so again, it wasn’t as bad as Twitter would have you believe. Stephen Gostkowski was 5-5 on extra points and nailed his only field goal attempt. Ryan Allen averaged 48.3 yards per punt but did outkick his coverage on one and it allowed the Colts to return it 32 yards. Julian Edelman was returning punts and looked very good. The Colts weren’t allowing Patterson to return any kickoffs and boomed them away. Faced with a short week, was there any doubt which team was the most prepared to go on Thursday Night Football? Bill Belichick had the team ready to go and they had a good gameplan and the offense looked like a house on fire racing out to a 24-3 halftime lead. After Luck and the Colts narrowed it down the one score early in the 4th quarter, the Patriots put them away with two big scoring drives. 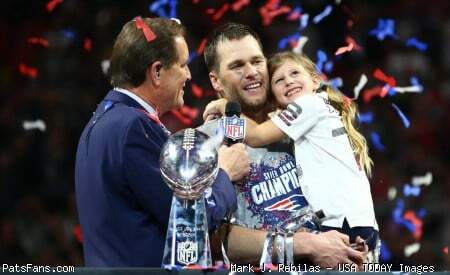 This entry was posted in 2018 Patriots Regular Season, NFL Commentary, NFL News, Patriots Commentary, Patriots Film Room, Patriots Milestones, Patriots News, Patriots Twitter and tagged 2018 NFL Season, 2018 Patriots season, Andrew Luck, Bill Belichick, Chris Hogan, Devin McCourty, Dont'a Hightower, Eric Ebron, Indianapolis Colts, Jabaal Sheard, James White, Jason McCourty, Julian Edelman, New England Patriots, NFL, Pat Chung, Patriots, Patriots edge rushers, Rob Gronkowski, Stephon Gilmore, Tom Brady, Trey Flowers on October 5, 2018 by Steve Balestrieri. Is the rivalry back on? For the first half of tonight’s game, it certainly didn’t seem so as the Patriots throttled the Colts to a 24-3 advantage at the break. But the team played a very sloppy third quarter and the Colts narrowed the lead down to a single score before the Patriots behind a strong game from Tom Brady pulled away to win 38-24 in front of a packed house in Gillette Stadium. The Colts, however, were equally as sloppy and the game was mired with five turnovers and after being treated to several good Thursday Night Football contests, fans were given more of what we’ve come to expect from these mid-week games. Julian Edelman returned to his first game action since the Super Bowl against the Falcons and didn’t seem to miss a beat. The Patriots made sure he was immediately targeted on the first play from scrimmage. Edelman had three catches on the first drive where Brady went 9-9 and finished it off with a TD pass to Cordarrelle Patterson. Edelman finished the game with seven receptions for 57 yards and was back returning punts as well. On the Patriots second drive, as they were again moving, Brady hit him wide open down the sideline and he dropped it. It was a scenario that would return…for both teams. Brady had a record-setting night and broke two milestones with just one pass. In the fourth quarter after the Colts had pulled within seven at 24-17, Brady led the Pats on a very nice drive and at the Colts 34, with seemingly all night to throw, he aired it out to Josh Gordon for a 34-yard touchdown. It was both the 500th of Brady’s career making him just the 3rd player to do so, but it also broke another record. Gordon’s TD reception made him the 71st player to catch a TD from Brady, breaking the record he shared with Vinny Testaverde. He finished 34-44 for 341 yards with three TDs and 2 INTs. The Colts were a banged up team on Thursday and couldn’t even field a full team of 46 active players, they could only dress 44. Please remind us NFL about how important player safety is again. And while the Colts defense is much better, and yes they were missing several players, the Patriots could have easily, should have easily dropped 50 on them. The Edelman drop certainly cost them points and Brady’s two interceptions were both in the hands of Patriots receivers who dropped them. Chris Hogan had a Brady pass right in his hands at the 23-yard line and into Mathias Farley’s hands ending another scoring drive. On the ensuing drive, Brady hit Rob Gronkowski down the seam that would have given the Pats a 1st and goal at the five. Instead, the ball was ripped out, (seemed more like a fumble) and Najeh Goode returned it to the 20. However, also on the plus side was the solid game by Sony Miche who racked up 98 more yards on 18 carries and he’s getting better and better. His 34-yard touchdown was a nice one where he got free on good blocking and then burst down the sideline untouched for the score. Andrew Luck seems all the way back from his injury and his arm strength which some were questioning before the game, seems fine, thank you very much. He dropped some dimes all over the field and lasered a few passes into tight window coverage as well. Luck finished with 365 yards passing with 3 TDs and 2 INTs, but after throwing 62 passes on Sunday, he threw 59 more last night and they desperately need a running game or he’s going to get killed out there. Eric Ebron had a huge game for the Colts and had his way all night long, despite being a bit gimpy himself at times. He finished with 9 catches for 105 yards and 2 TDs. Nyheim Hines had a solid game for Indy, he got 45 yards on the ground on 15 carries and added 45 more thru the air on seven catches. The Patriots defense had a solid first half and was gashed pretty well by Luck in the final 30 minutes. The Colts short passing game kept the chains moving as Indy rolled up 439 yards of offense. These are some troubling developments and much will have to be cleaned up considering their next opponent. The defense has 10 days to prepare for Kansas City’s passing game, and they have a lot of work to do. So who was up and down tonight? Tom Brady – The Patriots QB was his normal, unflappable self against the Colts, and he seemed to be able to carve them up at will. The Colts were only able to stop the Patriots passing game on the drops/interceptions in the second half. And to break two big milestones on one pass was pretty special. His touchdown pass to Gordon was reminiscent of a TD that he threw in 2007 to Randy Moss against Miami. That broke the record he shared with Testaverde. And it was also his 500th, making him just the third player (Brett Favre, Peyton Manning) to do so. Drew Brees is next on the list with 496. Brady as always gave the credit to his teammates. Sony Michel/James White – The Patriots 1-2 punch at the running back position was huge again for the team. Michel gave them 98 yards on the ground, including the 34-yard touchdown and one catch for 12 yards. White, on the other hand, was a thorn in the side of Indy’s defense catching 10 passes for 77 yards and a touchdown. He just two carries 0 yards, but one of those was a key 3rd and 1 conversion on the Patriots first drive of the game. The duo was fantastic and they each bring something to each element of the offense. Michel will eventually become a bigger factor in the passing game and we know White is able to contribute in the running game. We wrote earlier this week that with Edelman back and teaming him with Gronk and Josh Gordon would open up some room for White underneath. Tonight’s game was a testament to that. Jason McCourty – The Patriots cornerback has continued his strong play this season and he was very solid again tonight. He made two excellent plays, back-to-back breaking up passes including one in the end zone to Zack Pascal. J-Mac also had a nice play where he knocked the ball out from Pascal again and Jonathan Jones intercepted it to seal the game. The very next play, Michel rolled in from 34 yards to put the Pats back up by 21. Considering the way, the summer started, it looked like J-Mac was on the bubble. Now, that thought seems a bit ludicrous. And yes, he was given fits all night by Ebron who had the biggest game of his career and was constantly in trail. But the touchdown that Ebron scored against him was scheme driven. He was playing inside leverage and Ebron broke outside….oops. Great play call by Indy. However, it wasn’t D-Mac’s greatest game but it wasn’t the worst as some fans would think. Chung struggled to contain Ebron as well. Tip your hat to him and get back to work on the KC gameplan I guess. Chung otherwise was strong with 11 tackles, a pick, and a QB hit. Jonathan Jones- The Pats nickel corner had a pretty rough night. He seemed a tad slow off the snap all night long and was getting beat consistently and was resorting to a lot of grabby work which can result in a flag fest. Something that was mentioned in the broadcast. The Colts picked on him pretty consistently all night. We’ll have to rewatch the tape later today but it didn’t look like Jones’ best night either. But as with McCourty, Jones did get the pick on the interception. 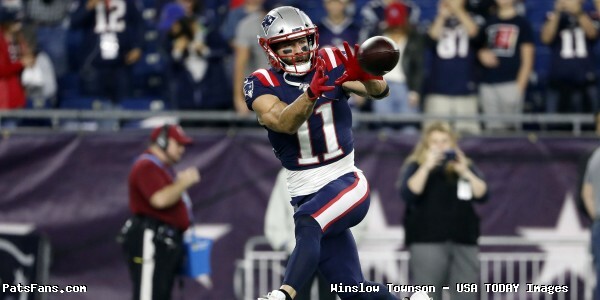 This entry was posted in 2018 Patriots Regular Season, NFL Commentary, NFL News, Patriots Commentary, Patriots Film Room, Patriots News and tagged 2018 NFL Season, 2018 Patriots season, Andrew Luck, Bill Belichick, Chris Hogan, Dont'a Hightower, Eric Ebron, Indianapolis Colts, James White, Jonathan Jones, Julian Edelman, New England Patriots, NFL, Patriots, Patriots edge rushers, Rob Gronkowski, Sony Michel, Stephon Gilmore, Tom Brady on October 5, 2018 by Steve Balestrieri. The New England Patriots played a much better game than we’ve seen all season last week at home against Miami. The Pats dominated the Dolphins at the line of scrimmage on both the offensive and defensive sides, cruising to a 38-7 blowout. The defense seemed to play much more physical and they stuffed the running game as well as covered in the secondary much better than they have in quite some time. The offense seemed to get untracked with the running game pounding the Dolphins for 175 yards while the passing game seemed to finally get untracked. The Colts enter the game 1-3 but could easily be 3-1. They lost an overtime game last week against division rival Houston when head coach Frank Reich went for a 4th and 6 at midfield with time running out in the OT session and they were stopped. Indy is really banged up right now with several players out for tonight’s game including leading receiver T.Y. Hilton, tight end Jack Doyle and starting corner Kenny Moore. The team played over 80 snaps on each side of the ball on Sunday and with the travel factored in, fatigue may become a factor in the second half. The Patriots have a chance to put two wins together and move over the .500 mark and start building some momentum. They’d love to get a win and then have 10 days to prepare for the Kansas City Chiefs. The Patriots got back Edelman from his four-game suspension on Monday and immediately the other players were talking about the energy that he brings to the field, the locker room and how it has a carry-over effect to the other players. But the reality is, despite Edelman appearing like his normal self all through training camp, he is coming off of ACL surgery where he missed all of the 2017 season. By Edelman’s own admission, he didn’t have his legs under him yet this summer, perhaps this month will have helped him get the rust out and have him ready to go. It will be interesting to see how the coaches and Brady use him tonight. I’d expect that they will go to him very early to get the jitters over with but limit his snaps a bit until he gets some game action under his belt. But with having him back and the addition of Josh Gordon last week, it has a snowball effect on the other Patriots receivers. Chris Hogan and Phillip Dorsett are more complementary WRs than a 1-2 combination, so now with Edelman and Gordon, drawing the top corners of the opposition, they’ll draw lesser competition and their production should increase. The Patriots very versatile and very important cog in the defense will be looked to a great deal tonight. Chung is so versatile and can do so many things, he often is overlooked at how valuable his presence is. He can play in the box in run support and is a very sure tackler. He can cover tight ends and is usually very solid in doing so. And at times he can even cover in the slot. Tonight with Andrew Luck missing a couple of his key weapons, look for him to try to get Eric Ebron heavily involved in the offense. Chung will no doubt see a lot of action against Ebron and it should be an intriguing matchup to watch. It was no coincidence that the turnaround for the defense had something to do with the return of Chung and Trey Flowers last week after they missed the Detroit game. The fact that he’s a captain this year speaks volumes of how not only the coaches but his teammates view him. He’s always a big part of the defensive game plan but should be an even bigger piece this week. The Patriots pass-catching running back had a big game on Sunday against the Dolphins. This was probably not a coincidence after Tom Brady had said the week before that they needed to get him more involved in the offense. White had a 22-yard touchdown and a highlight reel touchdown catch in the back of the end zone. White is so versatile in the Patriots offense, he can run, pass block and is a terrific receiver out of the backfield. Brady will often put him in motion to get pre-snap reads of the defense and then try to create a mismatch with a linebacker. With a Colts pass rush that is getting a lot of pressure on opposing quarterbacks, White may be an answer for some of that tonight. One way of keeping defenses from constantly pinning their ears back is to use the screen game and White is outstanding in that aspect. He should see a lot of touches in the game tonight. Last week, it seemed like the Patriots passing game was finally starting to click. Despite that, QB Tom Brady made some uncharacteristic mistakes and threw a couple of interceptions. Brady holds himself to a ridiculously high standard and will be looking to cut down on those this week against the Colts. Indianapolis has been outstanding at rushing the passer this season and has 17 sacks in just four games this season. So Brady will have to be spot on and be ready to get the ball out quickly this week. After struggling badly thru the first three games of the season in the air, the addition of Josh Gordon seemed to help loosen up the coverage for the other WRs. Now Brady gets back not only his most productive receiver but his slot guy, an area that they’ve really struggled with in his absence. And also the player that Brady is closest to on the team. Edelman’s return should do wonders for Brady’s confidence. 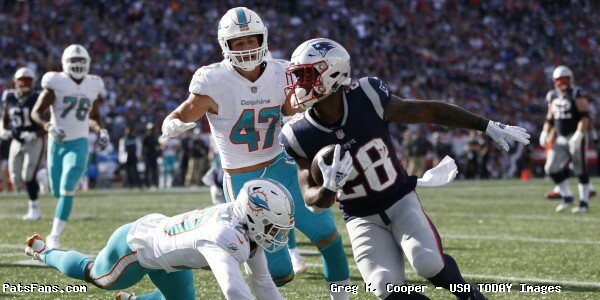 The Patriots linebacker had a very solid game on Sunday playing a part in keeping the dangerous Kenyan Drake from becoming a key part of the opposing offense. Van Noy is another one of the more unsung Patriots defensive members and he’s versatile and can do a lot in stopping the run, rushing the passer and covering backs out of the backfield. The Patriots lost Ja’Whaun Bentley in Detroit and their depth took another hit when Elandon Roberts was banged up late in the game on Sunday. Which means that more will be expected of Van Noy and Hightower. The Colts are also missing some key members of their offense this week, so they may lean heavily on running back Nyheim Hines. Hines leads all Indy receivers with 22 catches and is tied for second on the team with two TD receptions. He will be a key player to watch on the Indy side, therefore, stopping him and Ebron become very important. The Colts are converting third downs this season at a ridiculous 51.6 percent thru the quarter mark of the season. Part of the reason is the play of Hines, Van Noy may see a lot of action covering him tonight. 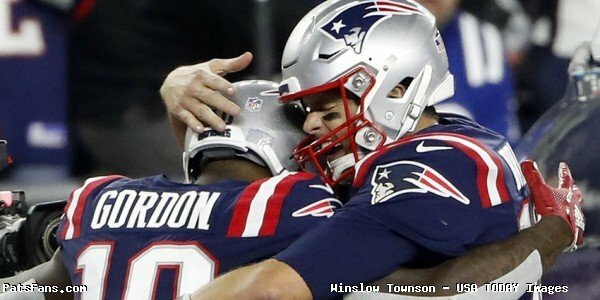 This entry was posted in 2018 Patriots Regular Season, NFL Commentary, NFL News, Patriots Commentary, Patriots Film Room, Patriots News and tagged 2018 NFL Season, 2018 Patriots season, Andrew Luck, Bill Belichick, Chris Hogan, Darius Leonard, Dont'a Hightower, Eric Ebron, Indianapolis Colts, Ja'Whaun Bentley, Jack Doyle, James White, josh gordon, Julian Edelman, Kyle Van Noy, Miami Dolphins, New England Patriots, NFL, Nyheim Hines, Pat Chung, Patriots, Rob Gronkowski, Sony Michel, T.Y. Hilton, Tom Brady, Trey Flowers on October 4, 2018 by Steve Balestrieri.